My embedded cinemagraph links back to flixel.com. How can I change this? The embed target URL is the web page your embedded cinemagraphs link to when clicked on. 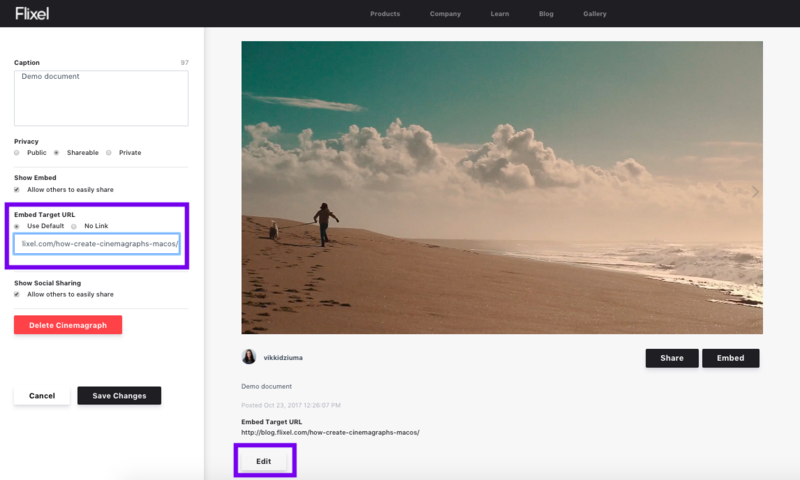 When you upload cinemagraphs to your Flixel gallery, the default destination link for your embedded cinemagraphs will be a unique flixel.com URL. Business plan subscribers can change the embed target URL to lead viewers to another destination on the web. Go to your profile and select the cinemagraph you wish to change destination link for. Select Edit. Your new embed target URL can be your personal or company website, a landing page - any destination you want. Otherwise, you can select No Link so that the cinemagraph is not clickable on your website or blog. Your embed target URL will be updated as soon as you select Save Changes on the edit window. Check out Managing your Flixel Gallery to learn more about the privacy and sharing options you can control on your flixel.com profile.